There's a total of eight bombs in the Witcher 3 with two upgrade tiers per bomb for the Enhanced and Superior versions. In this guide I'll be comparing all of the explosives in the game to help you understand which one to use in different scenarios and ultimately deciding which bombs are the best. Unlike Signs, the bombs in the Witcher 3 are relatively weak at the start of the game. It's only when you upgrade your Alchemy skill tree that explosives really start to cause serious problems for the enemy. You may have already noticed that bombs are much slower to use than Signs or direct melee combat; that's something you need to take into consideration when preparing for their use during combat. Aiming and throwing bombs follows a similar pattern to the crossbow, and just like upgraded Signs you can be interrupted in the middle of aiming a bomb thus forcing you to stagger and loose focus. So first up, let's take a look at that skill tree in more detail so you understand how Abilities affect bombs in the game. If you're interested in playing around with bombs then I strongly recommend maxing out the Bomb Creation column. Further slow down time while aiming Bombs. This is a great skill to improve because it's easy to get overrun while you're aiming a bomb. Bombs which do not deal damage now inflict damage that scales depending how far you progress this skill. A fully maxed out Pyrotechnics skill will improve your bombs to inflict 150 damage. Increase the maximum number of bombs (per type) that you can carry. Fully maxing this skill will give you seven bombs of each type; giving you a seriously good arsenal to fight with. The ultimate skill for those who love to use bombs. Upgrading this skill will make your bombs separate into fragments when they explode. Each of the fragments has the same damage effect as the original bomb so for example if the bomb was Samum then the fragments will each cause a blinding effect. In most cases, each bomb is designed for a different situation and more importantly a different enemy type. You'll find that as you uncover more Bestiary entries there are recommendations for particular bombs that work well against certain monsters. For example, the Moon Dust bomb is perfect against Necrophages such as Foglets which disappear out of sight and rematerialize right before an attack. Using this bomb prevents the Foglet from disappearing - forcing him to take on his material form instead. Similarly, the Samum bomb which blinds enemies is great vs the Fiend because it's a three eyed beast and particularly sensitive to light. That's just two examples of how different bombs are effective against different monsters. So now's the perfect time to look at each of the bombs in detail. For the purpose of this guide, I was maxing out the bomb skill tree and also using the basic bombs rather than the enhanced or superior versions (with the exception of Grapeshot). The Dancing Star bomb produces a fiery explosion that has a chance to catch enemies on fire. The bomb itself produces a spectacular explosion on impact, with the initial damage not quite living up to the spectacle. The main purpose of Dancing Star appears to be the damage over time buff thanks to the burning effect. This lights small patches of ground on fire which in in itself causes problems for enemies that step on the fire. Strangely enough, the Bestiary doesn't contain any reference to Dancing Star as an appropriate weapon against monsters. You could therefore say that the bomb is a general purpose explosive for clearing out mobs of monsters in a defined area and maybe better suited to human opponents rather than monsters. In my opinion, if you put Dancing Star side by side with something like the Firestream effect from Igni then there's no comparison, Igni wins hands down. However, if you like some distance between yourself and the enemy then Dancing Star is a decent bomb to keep handy. No bestiary entries for this bomb. The Devil's Puffball emits a toxic green cloud when it explodes causing damage over time to those in its vicinity. Players need to be wary of this cloud though as it also affects Geralt if he passes through the vapor before it disperses. Although a toxic cloud sounds pretty deadly I found that it was only effective against certain enemy types: it did very little vs Drowners but was very effective against high level human Bandits who choked to death quickly. Therefore, the Puffball bomb would be appropriate whenever you're venturing into bandit camps or during the Novigrad quests where the majority of enemies are humans. Small enclosures are better, forcing the enemy to interact with the cloud for longer and hence deal as much damage as possible. The Puffball is certainly not a good choice if you need to sword fight within the poison cloud unless you minimize the effects by combining this bomb with a potion to negate poisoning. This bomb releases a cloud of dimeritium silvers which block magic and monsters magic abilities. It's one of the most specific bomb types in the game and only suitable vs monsters that fall under the Elemental category. These include Earth Elementals, Fire Elementals and Gargoyles etc.. Using the bomb will prevent monsters from firing fireballs, ice blasts or flying through the sky to land on your head. Whatever the elementals magic trick is, this bomb will put a stop to it for a limited time. Outside of the Elemental category the bomb is next to useless and so it falls well down the list of most useful bombs in the Witcher 3. If you're trying to decide which bombs to purchase first then I'd leave the Dimeritium Bomb until later in the game, and possibly last. Releases a cloud of gas that can be ignited causing a huge blast. 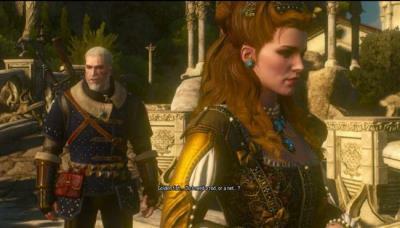 The cloud is poisonous to Geralt so care must be taken before venturing too close to the vapor. The best way to ignite the cloud is to use Igni while using careful timing to ensure that enough enemies are inside the cloud area to get maximum benefit from the explosion. I found that a high level Drowner would easily take 10% damage from a single blast and the radius was wide enough to ensnare several monsters in one go. The blast also causes a knockback effect similar to Aard but without the final knock down. The drawback to Dragon's Dream is the requirement to ignite the cloud first. Whilst this does give you time to tease the enemy into the right area, it also consumes your Stamina to cast the Igni spell for a brief moment. So if you're not using Igni as your main Sign then switching back and forth just for this particular bomb can cause some juggling during combat. Although the bestiary has no entries for the Dragon's Dream bomb, the explosion effect is pretty dramatic as well as effective so this in itself makes the Dragon's Dream a great bomb to use. Grapeshot is one of the first bombs you craft in the Witcher 3 (pre Griffin fight). It causes shrapnel damage to opponents caught in the blast radius and is considered a great weapon against winged monsters such as Griffins and Wyverns. Once upgraded, Grapeshot inflicts huge damage especially when combined with the cluster bomb skill. The explosive effects are awesome, ripping humans and monsters to pieces with very little effort. Unlike the other bombs in the game, this bomb doesn't have a damage over time effect but instead offers a powerful one off explosion to cause maximum damage. Therefore there's no fancy tricks when using Grapeshot; you're going for maximum damage right away. The Samum is another bomb you craft early in the Witcher 3 and it serves you well in the beginning. Unlike Grapeshot, the Samum bomb stuns opponents giving you a chance to launch an unopposed melee attack with your sword. Depending on the upgrade status, the blind effect can give you enough time to dodge or roll behind the opponent and launch a full Strong Attack while they're cumbersome. Unfortunately, if you launch the bomb too close to Geralt you will end up blinding him as well so careful timing is vital when using Samum. Overall the bomb is a general purpose stun grenade that works well against a variety of opponents. Another very specific bomb, Moon Dust prevents monsters from transforming and is suitable against Necrophages and Spectres - both of whom love to hide behind a "shadow" before launching a surprise attack on you. 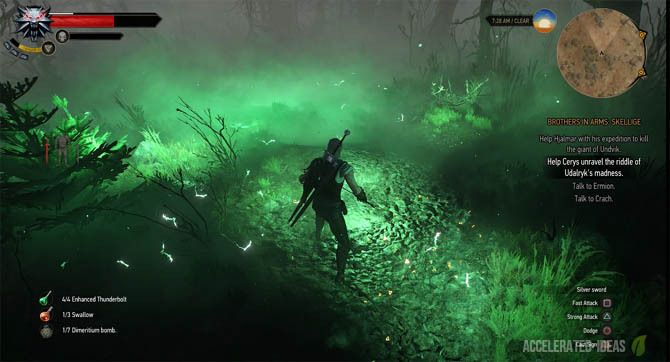 Using Moon Dust you can force a Wraith or Foglet to take on its material form, giving you a real target to hit rather than swiping at thin air with your sword. Outside of these two categories, the bomb is absolutely useless and possibly one to save for later in the game when you've got the luxury of money to spare. Northern Wind freezes opponents in it's blast radius and is like a safer version of Samum - which doesn't come with the headache of blinding you in the case of a misplaced bomb. Northern Wind was one of the first bombs I bought in the game and I certainly don't regret that purchase now. If used intelligently with a strong melee attack then Northern Wind can buy you valuable time against a stronger lone opponent. I generally wouldn't recommend this bomb for a group of fast moving opponents because the accuracy of most bombs isn't great and a mistimed Northern Wind is useless, merely freezing the ground rather than the intended target. It's hard to put the bombs in a list of best to worst because each one has it's purpose in the game. However, I believe there are some bombs which you should buy and use before others and so the list below is ordered from most useful to least. 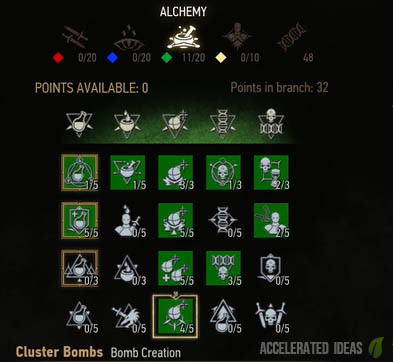 Overall, bombs are quite disappointing in the Witcher 3 unless you really progress the Alchemy skill tree and unlock the Bomb Creation skills. In particular the high level skill for Cluster Bombs (only available after Level 28) is the only way to truly make bombs interesting.